Feeling very meditative, as I sit three floors up gazing out at the sun setting over the Kilpatrick Hills on a clear night here in Glasgow (unusual event….!). Thought I’d share a favourite quote, which every time I read it walks me gently into Mystery. 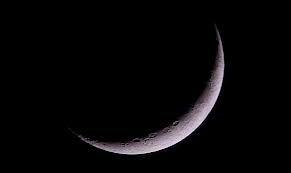 Have a peaceful night, as the month’s energy winds down and we approach the New Moon in Gemini on Wednesday evening. This entry was posted in 02 - New Posts: January 2014 onwards, Uncategorized and tagged Anne Bancroft, Kilpatrick Hills, New Moon Crescent, New Moon in Gemini, Women in Search of the Sacred. Bookmark the permalink. Wow, Anne. This one is a keeper of all keepers–so my experience! I’m not surprised it is attributed to the late, great Anne Bancroft. A totally amazing woman. Thank you for this share that I’ll continue sharing forward. Blessings! So pleased you have seen this wonderful quote, Joyce. Do pass it on, thanks! A wonderful quote, thank you very much! You are welcome. It’s one to which I return, just to remind myself…. It is a wonderful quotation, and worth some considered thought. But just now I’m logging of because its all thunder and lightning and rain! Oh, we have needed it. I believe I’ll have a glass of wine and just ponder her words until the storm passes. Thanks so much for sharing this! A pleasure, Linda! I should like to be sitting there with you, pondering, whilst the storm passes…. Nice…. because as we near the end of our time, the connection to the divine, if we have been searching for it, becomes almost tangible: no tokens or signs needed. Everything around us just shouts of the obviousness of what we have been searching for all along. Thanks for this, Emaria. Great to see you back!